After Gianni Bugno's doninating win in 1990, he was again the favorite for 1991. But Franco Chioccioli, who was still smarting from losing the lead on the frozen Gavia Pass in 1988, was riding as he never had before. He was far stronger than any other rider in the race. He cemented his lead with a masterful attack on the Pordoi Pass, the climb Fausto Coppi had used several times to distance his competition. With no podium placings so far in 1991, LeMond was again riding the Giro in training for the Tour and didn’t look to be a factor. The man who had given LeMond fits in the 1990 Tour after gaining over ten minutes in a fuga di bidone, finally finishing second, did have a good spring. Claudio Chiappucci won Milan–San Remo and the Tour of the Basque Country. A poor time trialist, Chiappucci was a fearless aggressor who would attack when his opponents least expected it. Franco Chioccioli had been knocking around for nearly a decade (he was Best Young Rider in the 1983 Giro) and perhaps if he had been given warm clothing at the top of the Gavia Pass, he might have won the 1988 Giro. Nicknamed “Coppino” (“Little Coppi”), as was Italo Zilioli, for his slender, lanky build and resemblance to the campionissimo, Chioccioli still ached to remedy his 1988 defeat. There was nothing in his 1991 win column so far. The Giro started on Sardinia and after three stages on the island, Franco Chioccioli was the maglia rosa with Bugno and Chiappucci trailing at 5 and 11 seconds respectively. 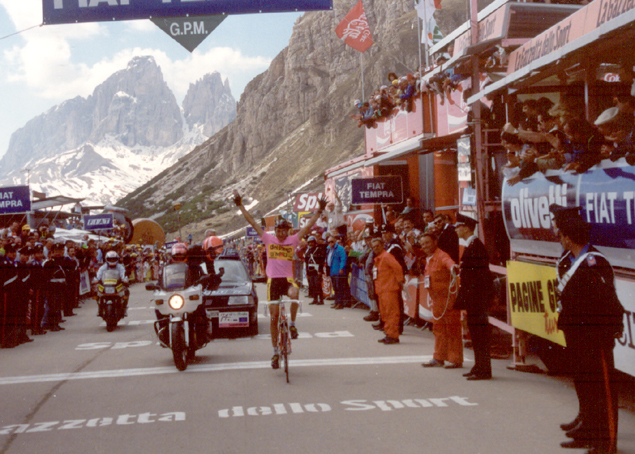 Since Chioccioli was one of those riders who always had at least one bad stage during a Giro, he wasn’t expected to take the Pink Jersey all the way to Milan. In fact he didn’t take it to the finish line in Sorrento after the Giro transferred to the mainland. Frenchman Eric Boyer on LeMond’s “Z” squad romped away from the field and there seemed to be no enthusiasm to catch him. Chioccioli, with the responsibility of the Pink Jersey, buckled down and did most of the work (according to his own recounting of the stage), keeping Boyer from running away with the race. Boyer got to take the maglia rosa after finishing a half-minute in front of the pack. Chioccioli was sitting in second place at 3 seconds but promised that the next day’s race through Abruzzo, with three rated climbs, would see a different Franco Chioccioli. As the word was spoken, the deed was done. Chioccioli and Marino Lejarreta broke away on the final climb of the day, Monte Godi, and maintained a 50-second gap over the Chiappucci and Boyer-led chasers all the way to the town of Scanno. Chioccioli had taken back the lead with Lejarreta (winner of the 1982 Vuelta and fifth in the 1990 Tour) second at 8 seconds. Boyer, Chiappucci and Bugno were trailing roughly a minute back. The next day, with another three rated climbs, was ridden without any particular aggression until the last hill, bad weather and the difficult descents on wet roads having kept the riders plenty busy. Things broke up on the last ascent, but the climb to Castelfranco wasn’t enough to pry apart Bugno, Chioccioli, Lejarreta and Chiappucci. Fignon and Boyer each lost a minute and LeMond struggled in more than two and a half minutes after stage winner Vladimir Poulnikov. LeMond started to show a little sparkle when he and Maximilian Sciandri squeezed out a five-second gap as the race roared into the Riviera town of Savona. 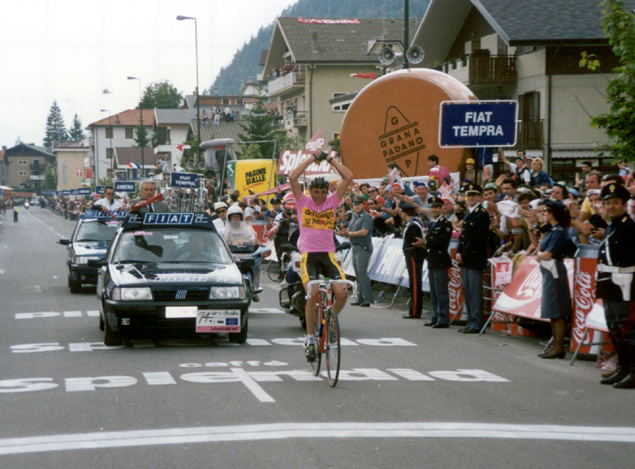 One couldn’t help feeling he might be repeating 1989 and 1990, dragging himself around the Giro and finding form just in time to win the Tour. Chioccioli definitely wasn’t dragging around. The twelfth stage had a hilltop finish on Monte Viso, an Alpine ascent near the French border and the source of the Po, Italy’s longest river. Lelli was the first to make it through the heavy fog to the finish with Jean-François Bernard with Chioccioli and Lejarreta just three seconds in arrears. Bugno was the surprise. No one expected him to lose two minutes in the first day in the Alps. He was supposed to inflict this kind of damage on the others. The second Alpine day concluded with two ascents to Sestriere and the order of finish was Spanish climber Eduardo Chozas followed in by Chiappucci, Lejarreta and Chioccioli. Bugno lost another 43 seconds. Heading off to the Dolomites, Chioccioli led Lejarreta by 26 seconds and Chiappucci by 1 minute 23 seconds. Bugno, two and a half minutes down, wasn’t the dominating rider he was the year before. Three days in the Dolomites started with at trip to Aprica via the Mortirolo and Santa Cristina. Chioccioli gave a master class in bicycle racing when he attacked on the Mortirolo and after reaching the crest alone, continued riding solo for 50 kilometers. He lost ground towards the end, but in Aprica he still was a half-minute ahead of Bernard and Boyer, and 46 and 48 seconds ahead of his two nemeses, Chiappucci and Lejarreta respectively. LeMond finally called it quits and abandoned. The next day with the Tonale and Gardena didn’t change things. The last Dolomite day was the tappone with the Pinei, Nigra, Pordoi, Fedaia and then a second climb to finish at the top of the Pordoi. Chioccioli escaped on the second ascent of the Pordoi, the pass Coppi had used several times to clinch Giro victories. That fact wasn’t lost on the history-conscious tifosi. Chioccioli may not have liked being called “Coppino” but he cemented the image of the campionissimo in their minds with his masterful attack on Coppi’s climb that took another 38 seconds from Chiappucci. The relentless Lejarreta crashed and with a time loss of over six minutes, his spirited pursuit of Coppino was over. Chioccioli’s nearest competitor now was Chiappucci, almost three minutes down. It was too much for Fignon, who was not only struggling to reach the condition he had enjoyed a couple of years ago, he was in the midst of a complete breakdown in his relationship with Cyrille Guimard. He was among the day’s seven abandons. The final obstacle to the year’s fuoriclasse (outstanding champion) rider was a 66-kilometer time trial at Casteggio, near Parma. Incredibly, the man of the mountains was also superb against the clock (though the day’s course did have a climb). Chioccioli flattened everyone; his nearest challenger Bugno was almost a minute slower. After nearly a decade of trying (his first Giro ride was 1982 where he came in 25th), Franco Chioccioli had won the Giro d’Italia in commanding fashion. There was no doubt he was by far the strongest man in the race. One of his first requests after the final stage in Milan was for everyone to stop calling him “Coppino”. That didn’t happen. Chioccioli’s win with a dominance that seemed to come out of nowhere wasn’t without controversy. French racer Erwann Menthéour was among those who accused the 1991 Giro champion as well as future Giro winner Evgeni Berzin of using the new performance improving drug EPO. In July Bugno and Chiappucci ran into a Spanish buzz-saw that splintered their Tour ambitions. Using the classic Anquetil strategy of defensive riding in the mountains combined with absolute mastery in the time trials, Miguel Induráin won the 1991 Tour with a quiet, seemingly effortless ride that left the fans speechless and his competitors helpless. By any measure Bugno’s 1991 season was still excellent: a fourth in the Giro (with three stage wins), second in the Tour, victory in the Clásica San Sebastián, and Italian and World Road Championships.